This is an ode to your visual cortex. It’s a little unsung hero that sits, unassuming, at the back of your brain. It’s small — almost hidden — but it dominates your senses and creates the world around you. You see, your visual cortex is fast. It processes visual information faster than the rest of your brain processes words. That’s why one of the most important things you can do to put a finishing touch on any piece of content is to add an image. The image you add to your next post, podcast episode, or social media missive may connect with your reader in 13 milliseconds (or less). You’re able to convey meaning before a single word is read. Are you fully engaging your readers’ brains with images? If not, read on. We’re going to talk about how to find, choose, and use images so you can harness their power in all of your content. Discover how to create stunning branded images when you register for my free visual content marketing workshop. Editor’s note: Copyblogger is an affiliate for Pamela’s workshop. On some level, we all know that images help draw attention to written words, even if just from our experience of paging through a website or looking at a social media platform. Great images tend to make us stop and look. There’s proof for this, actually. A 2013 study by MDG Advertising showed that content featuring compelling images averages 94 percent more total views than content without. Images don’t just draw eyeballs. They boost understanding (and memory), too. Images are powerhouse vehicles for boosting retention. But if you don’t consider yourself a “visual person,” how can you get started using images in your content? In the next section, you’ll find a short course on choosing and using great images. Let’s start with what not to do, shall we? The tips here will help you recognize the types of images art directors and graphic designers never pick when they’re looking for images to pair with written content. You know this image when you see it. It’s the overly posed, perfectly lit photo that doesn’t look anything like real life. Seriously? Who comes up with these photo concepts? You find a gorgeous image, and you really, really want to use it — even if it has nothing at all to do with your post topic. Images work best when they work in tandem with the words on the page — when they complement and add meaning to the words you use. Our content lives on our website, but it has an extended life on social media. And when we share images on social media, they’re often reduced to postage stamp size before they’re clicked on. That’s why it’s important to use images that translate and can be understood even when they are small. Simple images do this best because they don’t lose detail when they’re very small. I will not use Google Image Search to find my images. It is not good for finding images to use in your content. Finding and grabbing an image in Google Image Search and using it in your own content is an excellent way to invite a lawsuit. Images on Google Image Search are pulled from websites and displayed for search purposes only. It was never meant to be a place to find images to use. Images you find on Google Image Search are created and owned by someone. And that entity has every right to sue you for copyright infringement when you grab their intellectual property and present it as your own. If you’re using Google Image Search to find images, please stop immediately. It’s time to “go pro” with your image searching skills and learn how to find images you have permission to use for any commercial purpose you’d like. Keep reading, because I’m going to share what to look for in an image and my favorite image resources, too. Here’s what to keep an eye out for when you’re perusing the options on a stock photo site. Search for images that feature people who look like they could be your reader (on a good hair day). The ultimate goal of your image is to engage people with your content, so your image should complement your content title. When you do this right, you get a “double whammy” effect: both your image and your words communicate the same thing. Sometimes, headlines lend themselves to using a humorous image. This isn’t a solution you’ll want to use for every piece of content because humor has more impact when it’s unexpected. But when the topic can be communicated with a humorous image, it’s a nice way to get your reader smiling before they’ve even read a word of your content. Now that we’ve established that you will never, ever look for images using Google Image Search, let’s examine some reliable resources for free and paid stock photo images. There are some amazing stock photo sites out there where the images are completely free to use. In some cases, though, you’re asked to add attribution to the image. This means adding a photographer credit, and often a link. Image by Joshua Earle on Unsplash. It’s important to read the license on each site carefully so you give credit if it’s needed. Many sites don’t require this, and those are the ones I prefer because using one of their images is easy and fast. True confession: I get impatient with people who don’t want to pay anything, ever, for their stock photography. It’s a direct result of my professional experience. I have organized and art directed more photo shoots than I care to remember. And I’ve experienced the arduous behind-the-scenes work that needs to happen to create those beautiful images we use. Memorable images are a mixture of logistics, patience, creativity, a well-trained eye, and technical mastery. And I think that’s worth paying for. The majority of us are walking around with cameras in our pockets in the form of smartphones. And with each iteration of these devices, the quality of the photos they take goes up. Think about how you could represent your business visually. Spend some time brainstorming topics and subjects. Then walk through the world with an eye toward building a library of images you can use in your content. It’s the best way to guarantee your image will be 100 percent unique to your business. You may have noticed that our image style on Copyblogger changed about six months ago. We look for images that add a sense of meaning to our words — especially our headlines — since that’s the closest text to the image. Early on, we had to decide if we’d repeat our headline text on our images, or if we’d write original copy for them. We ran some tests and decided that we didn’t like the “double headline” effect of images with headlines on them. So, we set out to write original text for each post image we create. And, it turns out, this image text serves as a kind of subhead to our main headline. Basically, at the top of our posts, we give our readers not one, not two, but three invitations to engage with our content. We use a colored bar over most images to make text easy to read. We select one of our three brand colors for consistency. We always use the same font. Our images feature Proxima Nova, our brand font. We format the text the same way. Our text is formatted with a line of smaller capitalized text followed by larger text that often bolds a few words for emphasis. We add a watermarked logo to each image. 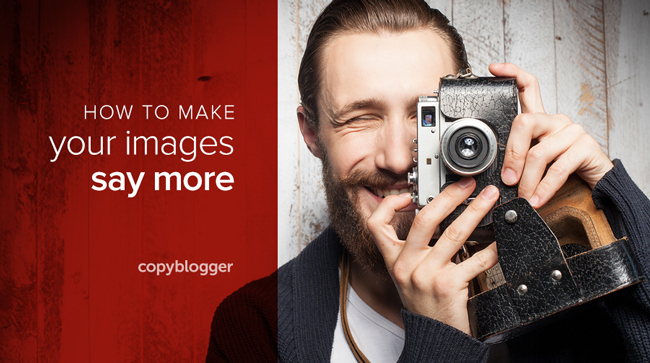 On every image, you’ll find a small Copyblogger logo. If our image gets separated from the post link, people can find their way back to our site and discover the content it refers to. We use Photoshop and a custom template we created to build our post images. Having a pre-created template makes the images quick to create and keeps them consistent over time. Canva: Canva is free with some paid upgrades. It’s easy to use and has a wealth of image controls. PicMonkey: PicMonkey is also free and has low-cost “premium” features you can pay a small fee to access. It’s fun and easy to create beautiful images using PicMonkey. If you haven’t been fully engaging your readers’ brains by using images with your content, the time to start is right now. Because it turns out that just like everything else in life, you’ll get more proficient and professional with your image creation the more you do it. Take the tips in this post and work on your first image today. And watch what happens when you fully engage your readers’ brains with compelling images! Pamela Wilson is the founder of BIG Brand System, where she helps people build online businesses they love. Grab her free marketing, design, and business-building resources.